Collectorhaven: Who was Judges Guild anyway? Who was Judges Guild anyway? 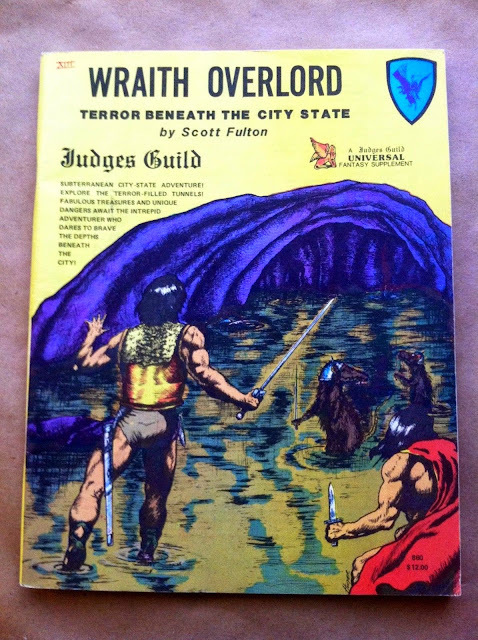 I'm seeing increasing interest in Judges Guild collectables. Although, if you are an AD&D fan the term may be "usable". Now I realize that most of you young whipper snappers out there will give up your video game controller when they pry it from your cold dead hands but...there was a time when people actually got in a room together and played something called a "role playing game". Woooooo. For 90% of the people out there, RPG was just another name for Advanced Dungeons and Dragons but there were certainly others like Runequest and so on. One of the very first companies to produce play-aids, adventures, and campaign settings for RPGs was Judges Guild. The "judges shield" that Judges Guild produced was a major hit. I don't know how many dungeon masters would hide their secret maps behind one of those things when running a game. It was so popular that "judges shield" turned into a term of art for dungeon masters. You just put up your judges shield and the fact that there was a company called "Judges Guild" that made the thing was not even thought about. Here is a good list of Judges Guild collectables. And I say "collectables" loosely because I suspect that some retro RPGers out there are buying this stuff to still play it. At their height, their campaigns were equal to any other RPG adventures out there. It really was a labor of love for the founders. I wish them a lot of luck and I hope that new generations of gamers rediscover some of the old classics. They were a LOT of fun!